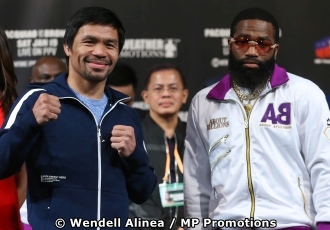 This was the message World Boxing Association welterweight titlist Manny Pacquiao wished to convey to his audience, which included Adrien Broner, who he will battle on Saturday (Sunday Manila time) for his crown of six months at the MGM Grand Arena. That he will be a different fighter than everybody who knew him, Pacquiao himself disclosed during Wednesday’s final press conference held at the David Copperfield Theater inside the MGM Resorts Hotel here. The now 40-year-old, for instance, who never predicted the outcome of his previous fights, intimated, however, that he will, this time when given the opportunity. I’ll do my best to win this fight,” he said. Broner, I believe is coming to the fight well prepared. I, we, in Team Pacquiao are prepared, too. Then diverting from his usual no prediction character, the only sitting congressman and senator, for that matter to win world boxing championships, added. “If the knockout comes up, that will be a bonus." Those who have been following him, his training team, headed by chief trainer Buboy Fernandez, conducted his training regimen, especially during the Los Angeles leg of the program, would’ve noticed the many changes in the program. One of these change was after each training session at the Freddie Roach-owned Wild Card Gym in Hollywood, Manny, an accomplished singer, would entertain his guest, members of his team and plain kibitzers with what many called ‘mini-concert’ at his place of residence. This practice, which he never done before in his 24-year pro-career, is considered by members of his training team as one of the biggest alteration in his training behavior. And to the amazement of everybody, his voice never got hoarse. Ni hindi nga minamalat despite rendering as many as 30 numbers per session per night,” one media man observed. 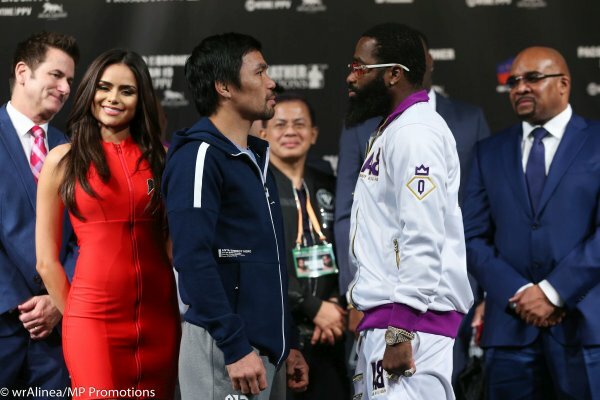 The Filipino fighting legislator, the only eight-division world belt owner, is ending a two-year hiatus from U.S. boxing ring when he stakes his crown against Broner on Saturday. He’s coming of a virtuoso performance only last July when he stopped Argentine slugger and then defending champion Lucas Matthysse in seven rounds in Kuala Lumpur. “I have missed fighting in Vegas. It's has been a second home to me, the three-time ‘Fighter of the Year’ and Boxing Writers Association of America ‘Fighter of the Decade’ said during the presscon.